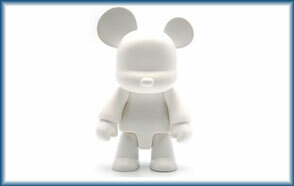 Qee, pronounced key, are a collection of toys created by Hong Kong based company Toy2R. The Qees vary in design- there is the Toyer, the Qee Egg, and the original Qee which comes with the head of a bear, dog or cat. Qees are collectible and many well known contemporary artists have designed figures. The standard size is 2.5 inch, but there are also 8 inch Qees. The smaller versions come with a keychain attachment.